A sparrow is a member of the genus Passer. They are small passerine birds which belong to the family Passeridae. They are also known as old-world sparrows. Sparrows often make their nests near houses or buildings. This means they are one of the easiest birds to see in the wild. The genus has about 30 species around the world. The best known of these is the house sparrow, Passer domesticus. Some authorities place other genera in the sparrow group: Petronia, the rock sparrows; Carpospiza, the pale rockfinch; and Montifringilla, the snowfinches. Sparrows are small birds. They are between 11–18 centimeters long. They can weigh between 13–42 grams. They are usually brown and gray. They have short tails and small, strong beaks. Most sparrows eat seeds or small insects. Sparrows are social birds and they live in flocks (groups). Male chirping, female looking around. The house sparrow (Passer domesticus) is a species of sparrow. It lives all over the world. It originally lived only in Europe and Asia. However, people travelled to new places and the house sparrow went to those places too. It is now the bird with the widest distribution. This means it lives in the most places. The species has about 50 subspecies. Sparrows can be seen on every continent on earth. A long time ago, they lived only in Europe, Asia and Africa. However, people traveled to Australia, North America and South America, and now sparrows are seen there too. The house sparrow is seen in every continent. In Australia, there are no sparrows in Western Australia, as they have not been able to travel across the deserts that separate that state from the eastern states. The government employs people to hunt and destroy any sparrows that might arrive. The house sparrow was introduced to America in the late 19th century. It was introduced on purpose. It was imported by several people, including Eugene Schieffelin, who was a wealthy New York City admirer of Shakespeare. He wanted to introduce to America all the birds mentioned in the works of Shakespeare. Two of these species were great successes: starlings and house sparrows. He organized a society for the importation of foreign birds, incorporated in Albany. Some ornithologists thought the Estrildid finches were in the same family as sparrows. However, they are now in a different family, the Estrildidae. There is also a group called 'American sparrows', or New World sparrows. These are also in a different family, the Emberizidae (buntings). The 'hedge sparrow' (also known as the dunnock) Prunella modularis is also not a true sparrow. It is only called a sparrow because a long time ago, people called all small, brown birds 'sparrows'. The name is still used today because it is a tradition. 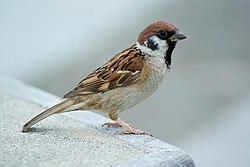 The house sparrow is small bird. It is between 14–18 centimeters (5.5–7.1 in) long. It weighs between 24–39.5 grams (0.85–1.4 oz). Females are smaller than males. Male and female house sparrows are different colors. The male is brown, gray and white. It has a black throat. The female and young house sparrows are brown and dark yellow or cream. They have streaks (stripes) on their heads and wings. The house sparrow lives close to humans, often near human houses in towns or cities. It also lives near farms and makes a nest in a bush or small tree. It can have two or three broods per year. This means it has two or three sets of eggs and chicks each year. The number of house sparrows in the United Kingdom has gone down, because their hedgerow habitat has shrunk. They are now 'endangered' in the United Kingdom. However, in other countries, the bird is still very common. ↑ Clement, Peter & Colston P.R. 2003. Sparrows and snowfinches. in Perrins, Christopher. The Firefly Encyclopedia of Birds. Firefly Books, 590–591. ISBN 1-55297-777-3. ↑ "House Sparrow - Australian Museum". australianmuseum.net.au. Retrieved 28 July 2010. ↑ "Department of Agriculture and Food - Many hands combine to remove sparrow threat". agric.wa.gov.au. Retrieved 28 July 2010. ↑ Christidis L. & Boles W.E. 2008. Systematics and taxonomy of Australian birds. Canberra: CSIRO Publishing. p. 177. ISBN 9780643065116. This page was last changed on 12 April 2019, at 20:47.